Coastal wetlands are important carbon sinks, all too often ignored as important ecosystems for preserving and indeed fostering and growing, for mitigation of climate change. In January 2013 I looked at how Mangrove forests threatened by Climate Change in the Sundarbans of Bangladesh and India. In December 2013 I featured a guest post on Philippines steps up restoration of mangroves as defence against typhoons, tsunamis, sea level rise. Read more of my posts on blue carbon. 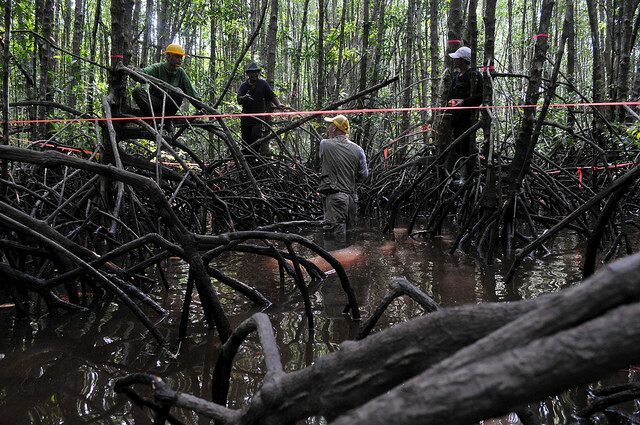 Research has shown that Mangroves among the most carbon-rich forests in the tropics (Donato etal 2011). Now a new study published in Nature Climate Change identifies the importance of preserving the extensive mangrove forests remaining in Indonesia for reducing it's greenhouse gas emissions. Prodita Sabarini is Editor at The Conversation. Mangroves provide a wide range of ecosystem services, including nutrient cycling, soil formation, wood production, fish spawning grounds, ecotourism and carbon (C) storage1. High rates of tree and plant growth, coupled with anaerobic, water-logged soils that slow decomposition, result in large long-term C storage. Given their global significance as large sinks of C, preventing mangrove loss would be an effective climate change adaptation and mitigation strategy. It has been reported that C stocks in the Indo-Pacific region contain on average 1,023 MgC ha−1 (ref. 2). Here, we estimate that Indonesian mangrove C stocks are 1,083 ± 378 MgC ha−1. Scaled up to the country-level mangrove extent of 2.9 Mha (ref. 3), Indonesia’s mangroves contained on average 3.14 PgC. In three decades Indonesia has lost 40% of its mangroves4, mainly as a result of aquaculture development5. This has resulted in annual emissions of 0.07–0.21 Pg CO2e. Annual mangrove deforestation in Indonesia is only 6% of its total forest loss6; however, if this were halted, total emissions would be reduced by an amount equal to 10–31% of estimated annual emissions from land-use sectors at present. Conservation of carbon-rich mangroves in the Indonesian archipelago should be a high-priority component of strategies to mitigate climate change. You can read an in-depth article at Centre for International Forestry Research (CIFOR) Forestry News blog: Indonesia’s best hope for slowing climate change. Watch a youtube video of Boone Kauffman from the Center for International Forestry Research (CIFOR) on Climate change implications of land cover change in mangrove ecosystems. Kauffman was one of the co-authors of the above study. After watching this you might not want to eat another prawn cocktail made with shrimp cultivated through aquaculture in Asia in former mangrove forest areas. CIFOR scientists and partners from the Indonesian Ministry of Marine and Fisheries install a sedimentation and carbon stock measurement tool called the Rod Surface Elevation Table Marker Horizon (RSET-MH) in various sites along the Pulau Dua coastline. 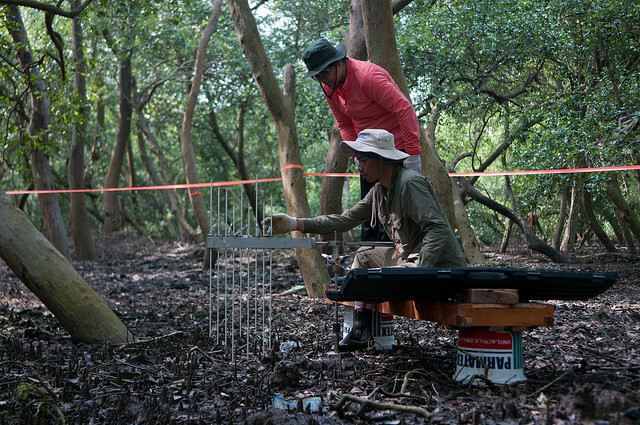 Center for International Forestry Research (CIFOR) scientist and researcher measure the diameter of mangrove trees in a study on above-ground and below-ground biomass in mangrove ecosystems, part of Sustainable Wetlands Adaptation and Mitigation Program (SWAMP). Kubu Raya, West Kalimantan, Indonesia.